Killer Bunnies are back and continuing their conquest with red companions who each have a special power! 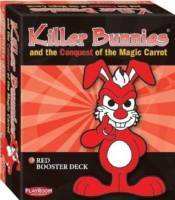 Killer Bunnies and the Conquest of the Magic Carrot: Red Booster Deck adds new cards to the existing Killer Bunnies and the Conquest of the Magic Carrot set, as well as a red 12-sided die. New cards include: "Orbital Missile Platform" for eliminating bunnies from orbit, "Kentucky Avenue" which allows players to steal a new Red bunny from an opponent, "Shuffleboard" for a quick Carrot grab and "Guardian Angel" to protect against Terrible Misfortunes. New mechanisms include a new Killer Bunnies market to buy back weapons for more fun and destruction, the election of bunny Senators to vote on game outcomes, and four new Carrots! If peace and salvation is what you crave, you'll love the card "Everybody's Dead, Dave". Want some vengeance against a foe? Drain his resources with "Scotty Doesn't Know". Hilarious good times are surely ahead, with the exciting new booster deck cards of Red!